Classification accuracy as a function of brightness for the PS1-PSC. The accuracy is measured via 10-fold cross validation applied to ~40k sources in the COSMOS field with morphological classifications from the Hubble Space Telescope (HST). The filled purple circles show that the PS1-PSC is >90% accurate down to 22 mag, and >80% accurate to 23 mag. PS1-PSC classifications significantly outperform classifications made from a single cut on i_PSF - i_Kron > 0.05 (shown in dark orange pentagons), especially at the faint end. The relative distribution of point sources ("stars") and extended sources ("galaxies") is shown via Gaussian KDE estimates of the PDF of each via the filled shapes at the bottom of the figure. Using a machine learning model, the authors classified ~1.5 billion sources from the PanSTARRS1 (PS1) first data release (DR1) as either resolved, extended objects or unresolved, point sources. This PS1 point source catalog (PS1-PSC) provides a probabilistic ranking of all sources with a score of 0 corresponding to extended objects and 1 corresponding to point sources. The classifications are based on morphological properties measured in the PS1 stack images, though not every source in PS1 has a classification (see the paper for known caveats). 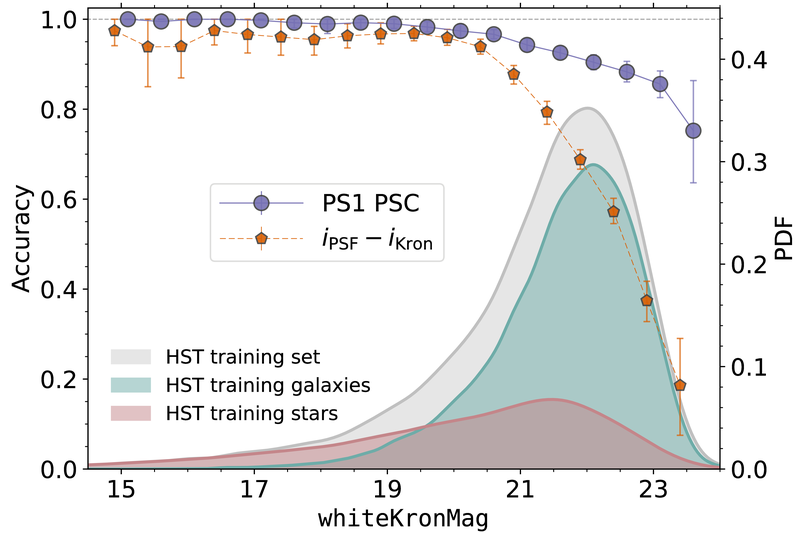 It has been demonstrated that this method does a far better job of selecting stars and galaxies than a single hard cut on the difference between the PSF and Kron magnitudes (see the figure to the right). A full description of the catalog is described in Tachibana & Miller 2018. You can refer to the PS1-PSC data products in papers or webpages using the DOI http://doi.org/10.17909/t9-xjrf-7g34. Please see Tachibana & Miller 2018 for a discussion of the known issues in the catalog. The PS1-PSC data release consists of a catalog stored in the "HLSP_PS1_PSC" context within MAST CasJobs. The pointsource_scores table contains the PS1 object identifiers (objid) and the machine learning score (ps_score) computed by Tachibana & Miller 2018, where a score of 0 corresponds to extended sources and 1 corresponds to point sources. 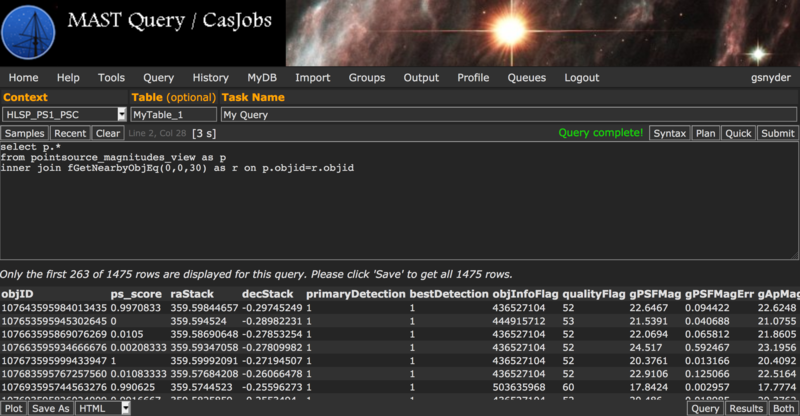 The primary way to interact with the PS1-PSC data is using MAST CasJobs which allows for SQL queries and the ability to cross-match the PS1-PSC classifications against other large catalogs in MAST CasJobs, such as PanSTARRS DR1. 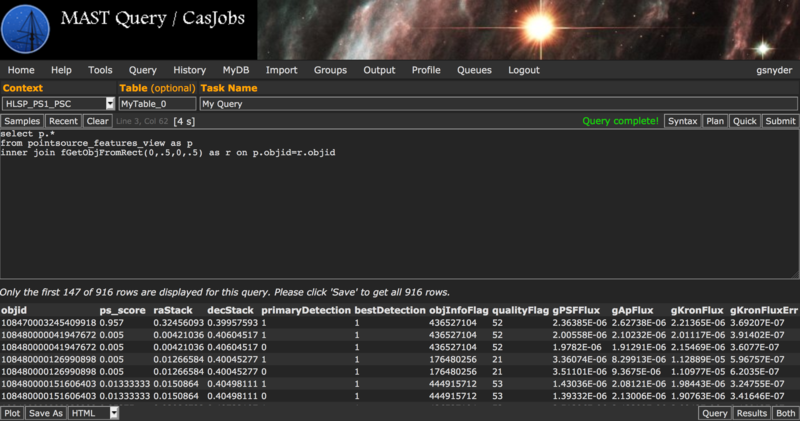 See the PanSTARRS CasJobs landing page and the PanSTARRS Data Archive page for more information and references. The PS1-PSC catalogs are stored in the HLSP_PS1_PSC database in the pointsource_scores table, as well as two Views combining these classifications with columns in the PanSTARRS_DR1 database, such as sky positions. One View (pointsource_features_view) includes the measurements used by Tachibana & Miller 2018 to generate the classification feature inputs, and the other View (pointsource_magnitudes_view) includes columns of common magnitudes and errors. 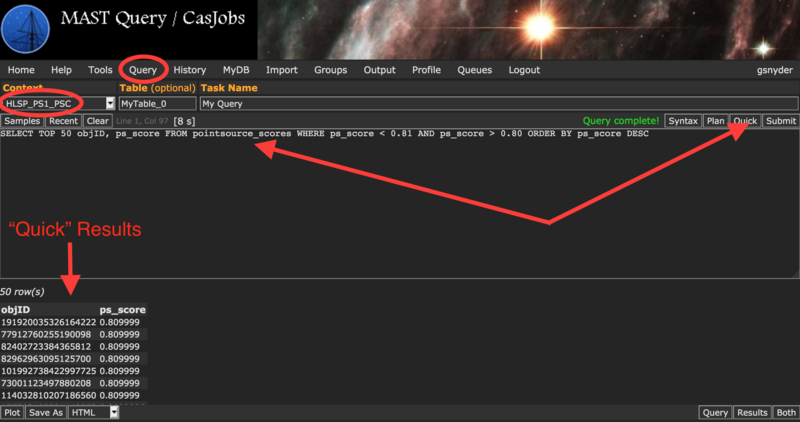 Example PS1-PSC Catalog Query From the "Query" tab, select "HLSP_PS1_PSC" from the Context drop-down menu. You can then enter your query. In this example, we are doing a simple query to get a subset of unique object ID numbers and point source classification scores. For short queries, like this one, that execute in less than 60 seconds, you can hit the "Quick" button and the results of your query will be displayed below, where you can export them as needed. For longer queries, you can select into an output table (otherwise a default like MyDB.MyTable will be used), hit the "Submit" button, and when finished your output table will be available in the MyDB tab. where <declination> is a string that indicates the lower limit of the 1-degree declination strip of sources contained in this file, taking on values from "-31" to "89" (including -0 and 0). You can access a list of files below, or use tools such as curl and wget to download the files. Note: there are about 10-20 total examples of table rows being duplicated in two files, because the source has a declination value exactly equal to the boundary of a 1-degree strip.